When you add an endpoint, SecureAnywhere identifies it in the Management Portal by its machine name. You might want to change the machine name to something more meaningful, such as "Gallagher-Laptop" or "LabTest-1." Note: Do not change the name of an endpoint on a virtual machine. If you do, it will appear as a new endpoint in the Management Portal and will use an extra seat in your license. From the Groups panel on the left, select the group that contains the desired endpoint. 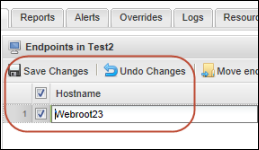 From the Endpoints panel on the right, double-click on the endpoint name in the Hostname column. Enter the new name and press the Enter key. A red flag appears in the upper left of the field to indicate that the change is not yet saved. Click Save Changes from the command row. The new name appears in the Hostname column. If you decide later to revert to the original name, you can click the Revert button on the far right of the row.